The tribe I want to talk about today is the Slivers, but I want to start by taking a step back and talking a bit about Legions in general and its place in the Onslaught block. There’s been a lot written already about how the “tribal” theme in Onslaught started out as a single Mistform creature and gradually evolved and expanded to take over the whole set. Along the way Onslaught grew an identity as the “creature block.” As soon as that theme took shape, it seemed obvious that Onslaught should have more creatures than normal sets – like maybe 75% creature cards. No one thought a large expansion with 100% creatures would work so that was never seriously considered. Magic needs spells in order to play well. However, no one thought the ratio had to stay right at the 55% - 45% split we usually use so we upped the creature count in Onslaught dramatically. Meanwhile we also wanted to convey this message to anyone who was opening booster packs, so we tried making every single uncommon in Onslaught a creature card. After playtesting with Onslaught for a couple months we came to two important conclusions: 1) Magic still plays just fine when 75% of the cards are creatures and 2) Having all the uncommons be creatures was not a very exciting gimmick. Onslaught’s tribal theme was working out nicely, but the “Creature Block” theme just wasn’t coming through very strongly. When we sent the set around to our playtesters, many of them didn’t even notice that there were a bunch of extra creatures running around. We’re really happy with how things turned out. The change came fairly late in our process and a lot of people inside Wizards had to scramble in order to get art, names, and flavor text for the new spells, but it was definitely the right thing to do. 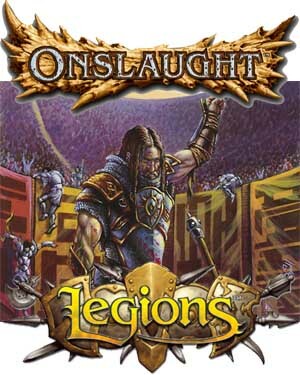 Legions wound up with a very cool hook and Onslaught still had plenty of goodness left over. That brings us to Slivers and their role in Legions. We knew we wanted to continue the tribal theme that started in Onslaught and Slivers were some of the coolest tribal cards we’ve ever done. There were some arguments about whether we really wanted to add a ninth relevant tribe into the block. It took up space and used up tribal card designs that we could have given to the original eight tribes. However, in the end we knew how popular Slivers had been and we knew players wanted us to bring them back at some point. We have also always thought they were a cool mechanic and we wanted to bring them back while the Tempest block was still legal in Extended (so the two batches of Slivers could interact in tournament play). Thus the Onslaught block got its ninth tribe and players everywhere get to dust off their old Sliver decks and add in some new toys. Synapse Sliver should make an interesting addition to new and old Sliver decks alike. Where Does This Ability Go? Some regular readers may be wondering what the “Ophidian” ability is doing back in blue. Didn’t we move that ability to green as part of the great pie dividing process? Wasn’t that what was up with Hystrodon? We’ve known all along that we needed to take things out of blue and that green has always had a bit of a card-drawing theme (Sylvan Library, Kavu Climber, Collective Unconscious, etc.). Since green is the creature color we figured, hey, why not move Ophidian into green? That was our plan when we made Hystrodon. However, as the designers kept working on more sets (including Legions), they realized there was a flaw with our plan: When we do cycles of creatures that all have a color-specific ability, what could we give to the blue one? Flying is the obvious ability to put onto the blue member of a creature cycle, but a) we don’t want to always do flying, b) we want to sometimes use fear as the black ability in cycles and it’s kind of lame to have flying and fear because they are so close and c) we’re moving our strongest fliers into white. So we needed some creature ability that we could use in blue, especially if we did a cycle of “saboteurs” (creatures that do something if they deal combat damage to an opponent). Basically, blue needs the Ophidian ability and so we had to look elsewhere as we trimmed blue’s slice of the pie down to an appropriate size. Green can still share the ability and we might do more Hystrodons in the future, but we now realize it was a mistake to subtract that ability from blue entirely and there will definitely be more cards like Synapse Sliver in the future. Meanwhile, go to the Legions Prerelease tomorrow. If you get a Synapse Sliver you might want to consider putting some islands into your deck . . .
What do you think of double strike? I’m sure Wayne Alward is happy to hear that!